Technical analysis is all about evaluating probabilities. There are no sure things when you evaluate a chart: just guideposts. 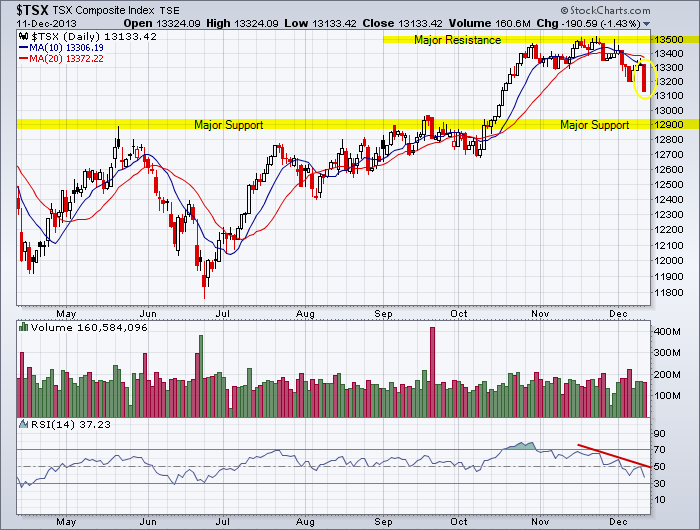 In the near-term, the above chart indicates a high probability that the TSX Index will test support of 12,900. And there is a low probability that the index will break resistance of 13,500. Reference the last chart analysis for the TSX Index showing the performance by sectors. Reference the last chart analysis for copper which has a major impact on the materials sector. Reference the breakout for the TSX above resistance on October 18, 2013. This is now the support zone on the above chart. The reversal of roles is an important concept in technical analysis. Reference the importance of the 12,900 support zone which was a a area of consolidation back to early 2012. This entry was posted in TSX Index and tagged major support, resistance, shaven bottom, shaven head candlestick, Technical Analysis, TSX on December 11, 2013 by Trader.